Cali is often bored. I work from home, so I spend several hours a day at the computer. Cali finds this tedious, and often suggests alternative activities. She’ll bring her ball in and suggest a game, for example. But she has also taken up a couple of pastimes on her own. When we were still living in Petaluma, Cali (and Jana) loved spending their days out in our little yard while I worked. I put up a bird feeder, and we soon had a large flock of regular diners. They’d scatter instantly if I came out, which I found a bit hurtful. I was the one who bought and served their meals, after all. They’d settle back in to the feeder if I sat outside quietly, though, so I forgave them. They never minded the girls, though. Cali could come and go as she pleased. She spent many hours with her bird friends. Here in Missoula, I put the bird feeder up near our patio. Cali has to watch from inside, but she lies on the carpet by the sliding patio doors and watches the birds. There’s a chubby squirrel who often pays a visit, and Cali gets very agitated. She’ll run to the office; I’m not sure if she’s trying to look out the window here or just tell me what’s going on, but she runs back and forth, panting. So I get up and chase the squirrel away. This happens three or four times and then the squirrel gives up for a few days. He always comes back, though. I suspect that he has several bird feeders, perhaps all equipped with tormentable dogs. In any case, he’s quite well fed. The birds do not fly away when Cali is there, or when she comes and goes. But, like the Petaluma birds, as soon as I walk into the living room, they disappear. When I go out to refill the feeder, there’s not a bird in sight. They’re close by, though. They reappear within seconds after I go back inside. When the birds leave, Cali moves to the bedroom. From the bed, she can watch the comings and goings of everyone in our building. She’s always sure to let me know when UPS or FedEX is about to knock on the door, but, unless another dog spends too much time standing outside our window, she’s content to watch quietly. Cali’s other hobby is watching dog and wolf shows on TV. 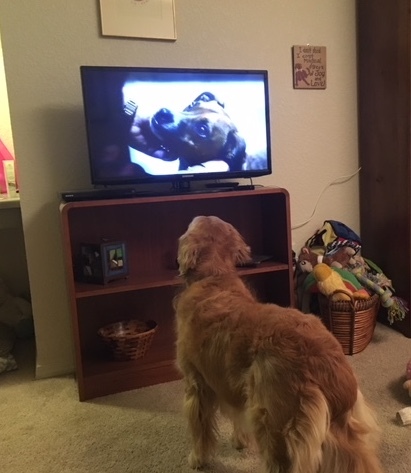 She’s sometimes interested in other nature-themed documentaries, but, really, it’s wolves and dogs. The other day, I was fiddling with a new digital antenna and managed to tune in PBS, crystal-clear. A show on arctic wolves was on. They were eating (I was not, thankfully). Cali ran in from the bedroom and sat right up in front of the TV, mesmerized. My mom always told me not to sit that close, but I didn’t think that a few minutes of watching would harm Cali’s eyes. 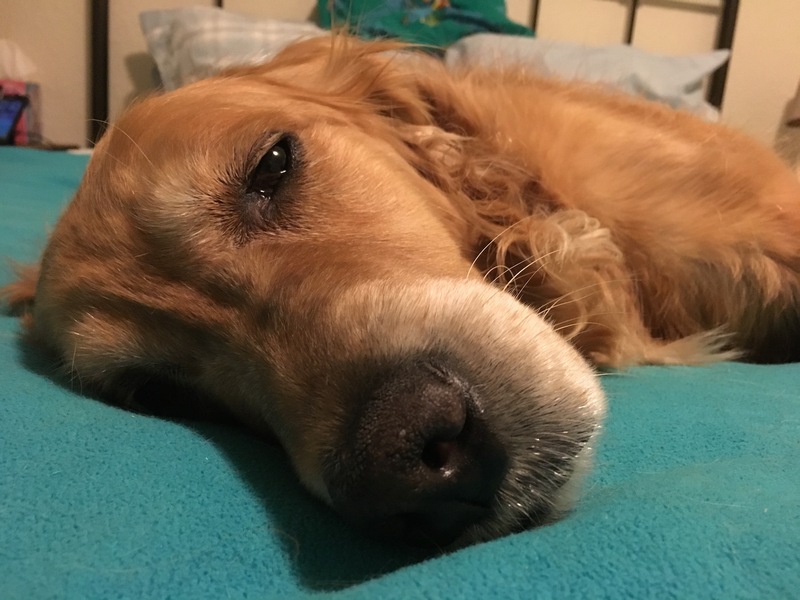 As soon as the wolves were replaced with people, Cali lost interest. Then, a few days later, I got a text message with a video of Dora (Cali’s sister) playing with her friends. As soon as Cali heard Dora’s bark on the video, she came running into my office. I held the phone where she could see it, and she was again, fascinated. I don’t know that she recognized Dora (maybe! ), but she was certainly interested in watching the dogs play. Cali’s great aunt, Oriel, used to love watching TV. Jana was not much of a TV girl. I’m really curious about what the TV watchers are thinking. And, who knows? Maybe Cali will improve my viewing habits. She’s shown no interest in Grey’s Anatomy, for example. Maybe I need to watch more PBS documentaries, just to spend more quality time with my dog. Oh, Cali is boy crazy. She’d be delighted if Clooney showed up in our living room! Ha! A boy crazy dog. I don’t know that I’ve ever heard of that.